That’s right, the super beard was finally shaved off, and the survivors got a glimpse at just what was inside Alexandria. And while things seemed normal, like really normal, there was still a sense that something must be amiss and too good to be true. 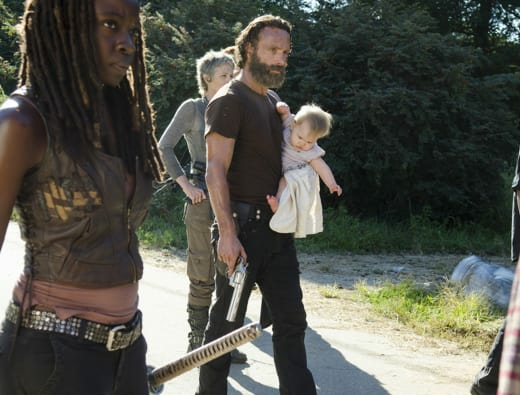 It’s not surprising that many of the same sentiments Rick and the survivors shared in The Walking Dead Season 5 Episode 11 carried over to The Walking Dead Season 5 Episode 12. Michonne was probably the most accepting of Alexandria, while the rest of the survivors continued to follow Rick’s lead of testing the waters and not just jumping into what seems like the answer to their prayers. But, throughout the hour, meeting the new people, exploring the community, I couldn’t help but also want to trust and accept Alexandria as a real safe haven. It also made me think that Woodbury and its inhabitants felt far more cartoony when compared to Alexandria. 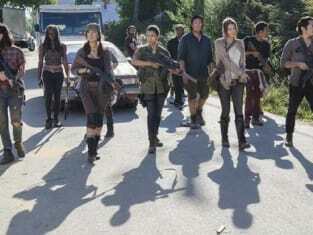 The Governor and his henchmen, the zombie fights at night, that whole experience felt like a glaringly bad situation. So it’s fantastic that there is a level of suspense and tension when it comes to Alexandria. You just can’t tell what the real truth is when it comes to this new place… yet. I also am interested to learn more about these new characters and see their interactions with Rick and his crew – Aiden, the kids around Carl’s age, Deanna, and even Jessie. Though, I really was thinking that Rick might get the chance for a little romance with her. That is until her creepy husband called out for Rick in the dark. 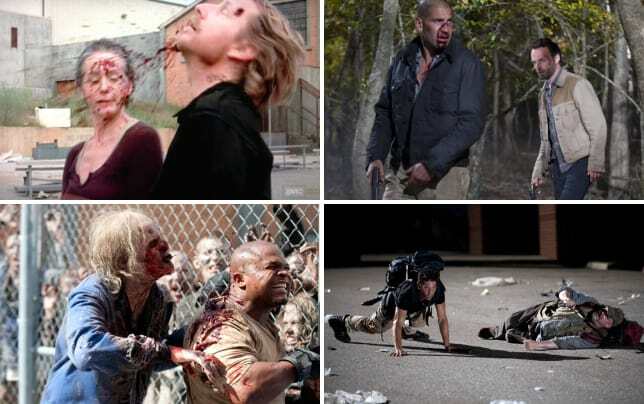 If anything, it was entertaining to see the people of Alexandria when compared to Rick’s group, and that was beyond their cleanliness – just their general demeanors, the way they carried themselves, the way they handled walkers. There was such a clash of two different worlds. I mean, after all that time living in the post-apocalyptic world and then to find a place that seems to have everything normal? Video games? And I loved Daryl scoffing at Carol’s outfit or holding onto his possum. I’m not surprised Daryl hasn’t been quick to “play house,” but it makes me wonder how long he’ll keep that up. The survivors have gotten so good at the outside world that being domesticated again seemed so foreign. And I loved watching that, even the way the group stuck together in the house. So far it seems that Alexandria checks out. Sure, there could be some more personal squabbles or confrontations, but I don’t think they are cannibals and they are definitely not the people of Woodbury. And the threat of walkers only really takes place outside. But I do wonder what happened to Rick’s hidden gun. Maybe Enid took it? Maybe its not something sinister? This was such a wonderful introduction to a new chapter for The Walking Dead that I’m far more invested again as to what is going to happen next. Now, we’ll see if something is up soon enough or what the show will be like if the group spends more of its time inside the walls then out. While the hour lacked the walker intensity of last episode and felt like pretty much a continuation of that trust/don’t trust theme but in a clean and “normal” environment, I was engaged ​– even in something as simple as Rick shaving or the group taking a walk around town. I even liked the glimpses into the different characters’ one-on-one chats with Deanna. The possibilities of this new locale, people, and what might be in store for Rick and the survivors once again has elevated my excitement. This stop just feels different, and I’m looking forward to seeing more of Alexandria. However, like Rick and the others, I’m still not quite ready to whole-heartedly trust the place either. Do you trust Alexandria? What do you think will happen next? Sound off below, and see the survivors' journey to get to this possible safe haven when you watch The Walking Dead online now. NOTE: The Walking Dead Season 5 Episode 13 will be titled "Forget" and air on Sunday, March 8.